Soak rice in 3 cups of water for a couple of hours. Crumble cinnamon and toast it on a small skillet. Strain the rice and blend it with the cinnamon and milk. 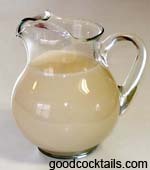 Strain mixture into a pitcher and dilute it with 4 cups of water. Add sugar to taste. Many people call this drink, "Horchata"